Retirement plans are fond of target-date funds, too. Vanguard estimates that 46 percent of plans had adopted automatic enrollment for participants in 2017, up from 2 percent in 2004. And of those, 97 percent chose target-date funds as the default investment option. For the uninitiated, target-date funds are billed as a one-stop retirement savings plan. Each fund holds a mix of stocks and bonds and targets a future year of retirement. As that year approaches, the fund becomes increasingly cautious, shifting more of its allocation from stocks to bonds. For example, a target date 2060 fund might start with a 90/10 allocation to stocks and bonds and gradually glide to a 40/60 allocation by 2060. It’s not surprising that target-date funds are a hit. For retirement savers, they’re far easier than cobbling together a portfolio from a grab bag of mutual funds. They’re also a boon for retirement plans, which have shown little interest in educating participants about how to assemble a sensible retirement portfolio. Target-date funds give them an excuse to dodge that task altogether. But target-date funds are no cure-all. One obvious defect is fees. 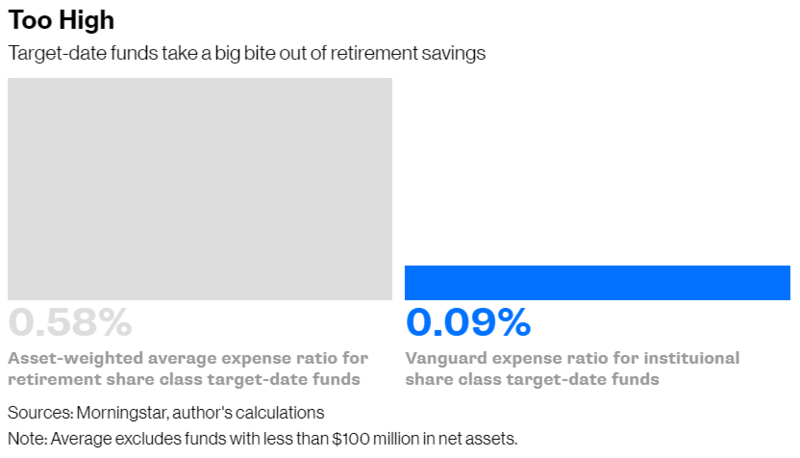 I counted 227 retirement share class target-date funds with $100 million or more in net assets. Their average expense ratio is 0.67 percent a year, and their asset-weighted average expense ratio — which accounts for the size of the funds — is 0.58 percent. It’s also not clear why retirement savers should own more bonds over time. People are living longer and a bond-heavy portfolio raises the risk of running out of money. And that isn’t the only risk. I simulated a target-date portfolio that starts with an 80 percent allocation to the S&P 500 Index and a 20 percent allocation to long-term government bonds. It then reduces the stock allocation — and increases the bond allocation — by 1 percent a year, ending up with a 40/60 allocation 41 years later. I then compared the performance for every 41-year period from 1926 to 2017 to that of a static 60/40 portfolio. Overall, the total returns are nearly identical. The target-date portfolio beat the static one by an average of 0.1 percentage points a year. And the target-date portfolio was slightly more volatile. Its standard deviation was on average 0.6 percentage points higher than that of the static portfolio. 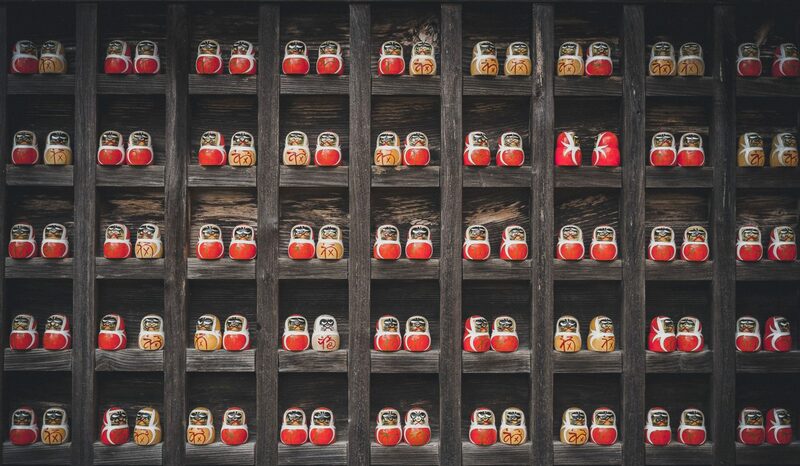 The difference, however, is that the target-date portfolio introduces an element of random chance. Because it allocates more to stocks in the beginning, whether those early years happen to coincide with a bull or bear market has a lasting impact. During the 41-year period beginning in 1949, for example — just before the epic bull market of the 1950s — the target-date portfolio beat the static 60/40 portfolio by 0.6 percentage points a year. But during the period beginning in 1929 — just before the Great Crash — the target-date portfolio lost by 0.9 percentage points a year. And all of that assumes investors can hang on to their target-date funds, which isn’t clear, either. Of the 227 target-date funds I looked at, Morningstar calculates five-year investor returns for 154 of them. Investors failed to capture the fund’s return in all but eight of those 154 over the last five years through June. They gave up an average of 0.83 percentage points a year, or an asset-weighted average of 0.86 percentage points. The combination of those factors — high fees and the potential for unlucky timing and misuse — could easily add up to 1 percent to 2 percent a year in lower returns, costing retirement savers hundreds of thousands of dollars over the course of a career. 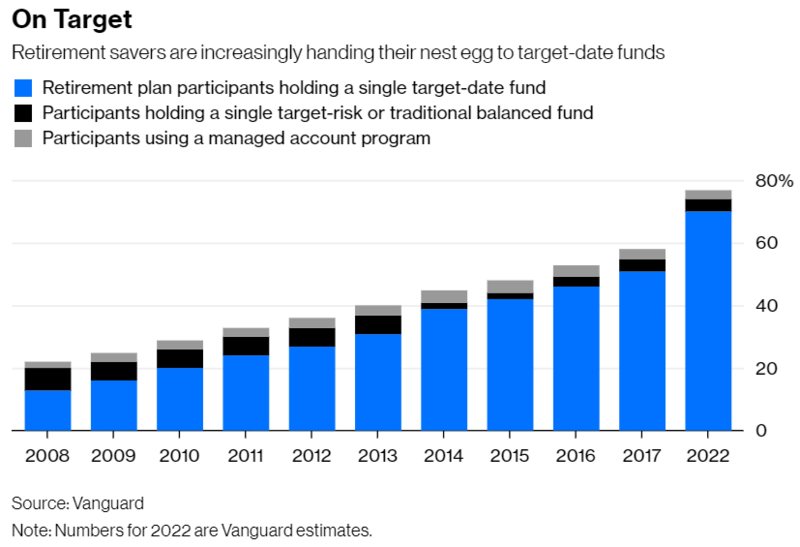 Yes, target-date funds are a step forward, but I suspect few retirement savers understand the cost and risks, and even fewer retirement plans are eager to point them out.